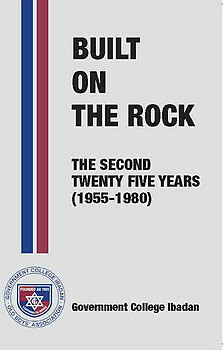 Originally published in Nigeria in 1990 to commemorate the 60th anniversary of Government College Ibadan (GCI) in 1989 this Special US edition of BUILT ON THE ROCK The Second Twenty Five Years (1955-1980) was (re)published to make the book available at the 2007 Annual General Meeting (AGM) and End of Year Festivities of the Government College Ibadan Old Boys Association (GCIOBA) -USA Chapter held at Houston Texas between the 14th and 16th of September 2007 with special Guest of Honor and Keynote Speaker being Noble Laureate and Old Boy of the 1946 entry set, Prof. Wole Soyinka. This book is all about a journey back through 1955 to 1980 into Government College Ibadan from those who belong to it. It brings together in jest and zest some of the memorable events. In jest, great seeds have been sown, great associations made and we now carry forever, in one form or the other, the mark of a great school. This book attempts to rekindle a bit of it all. GCI Old boys interested in obtaining copies from the remaining stock should kindly contact us via any of our customer service numbers or email.